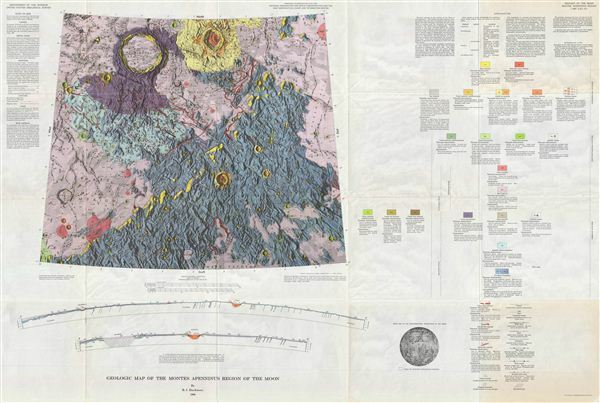 Geologic Map of the Montes Apenninus Region of the Moon by R. J. Hackman. This is the U.S. Geological Survey's stunning 1966 full color Geologic Map of the Montes Appeninus Region of the Moon. Named after Italy's Appenines Mountains, this rugged mountain range features the Moon's highest known mountain (though not highest point), and forms the southeastern border of the large Mare Imbrium, or left eye of the Man in the Moon's face. The crater Archimedes can be seen on the upper left portion of the map, Marco Polo in the lower center, and the Mare Imbrium on the lower left. This range became famous three years after this map was made, when Apollo 15 landed here and became one of the most scientifically successful missions of the Apollo program, and the most geologically diverse site of the program. It is believed that most of the moon's craters were formed approximately 3.9 billion years ago, during a period of intense bombardment in the Inner Solar System. The cratering rate fluctuates as collisions in the asteroid belt send fragment clusters into the Inner Solar System. This map might show hypervelocity impact craters caused by the same cluster of asteroids that, 65 million years ago, caused the extinction of the dinosaurs. As humans wouldn't land on the moon until 1969, how were we able to map its geology? The map's extraordinarily detailed metadata explains that the cartographers used photos dating back to 1960 (remember the series of Ranger missions in the mid-60's? ), and observations from optical and radio telescopes, with relief created by measuring shadows, combined with an assumed sun angle and an assumed base elevation. The geology was arrived at from observing differences in, and layering of, topographical forms, and in varying albedo (amount of reflected sunlight), both of which indicate different underlying materials formed under different processes. Goals of this work included the identification of suitable moon landing locations, and sources of oxygen for possible in establishing a more permanent lunar base. The map also includes two sectional views (from the side) of the area, detailed ‘metadata' explaining the mapmaking methodologies and symbols employed, and an index map showing the area's location on the Moon. This map series represents a breath-taking leap forward not only in selenography (the study of the moon), begun in the late 1400s, but also in the record of humankind's fearless exploration of the world(s) around and beyond us. This map would be a great companion piece to the other maps in the Geologic Atlas of the Moon,. It would also wonderfully complement early explorers' maps, or any of the plates from Burritt's famous 1856 Atlas to Illustrate the Geography of the Heavens , one of writer H.P. Lovecraft's most prized possessions. Created by R.J. Hackman and published as plate I-463 in the United States Geological Survey's Geological Atlas of the Moon.